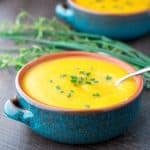 The ultimate fall soup, roasted butternut squash packed with so much flavor it'll be a new favorite! Add stock, brown sugar (or maple syrup), and squash and bring to a boil. Cover, reduce heat, and simmer for about 10 minutes (or until the squash is very tender). Season with salt and pepper to taste and garnish. If you don't want to deal with cutting up a whole squash, purchase about 4 cups of peeled, diced squash from the produce section. Toss with olive oil and roast the squash in the oven (as directed), until tender. If you don’t care for a spicy soup, omit the cayenne pepper. Recipe adapted from Gourmet Made Simple: A Fresh Approach to Flavor with Gena Knox.